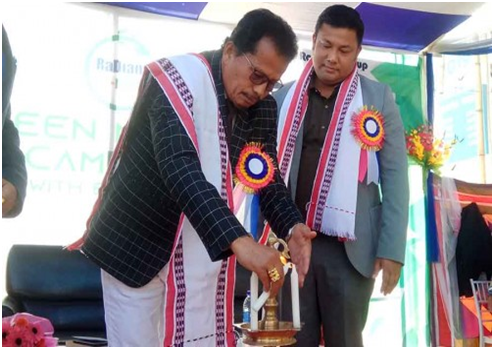 ‘Green Manipur-2019,’ a campaign organised by the Radiant Group was launched at Radiant E-Ride Showroom, Ghari Awang Leikai today.Addressing the function, chairman of Manipur Pollution Control Board, and Khadi and Village Industries Board, L. Radhakishore said that Keishampat Junction area was found having high carbon components during the air pollutant test conducted in and around Imphal area. Manipur Pollution Control Board conducted a test in some zones of Imphal area daily from morning 6 am to evening 5 pm, and it has been found containing carbon in high amount. Expressing his unhappiness that people are roaming around Khwairamband Keithel and Ema’s selling things inhaling the harmful air, he said all are consuming carbon which affects health and it may cause serious illness. Talking about air pollution and noise pollution, he said that diesel vehicles driving inside and across Khwairamband Keithel should be banned. The people have violated the notice issued by MPCB for banning diesel autos at sensitive zones. He further mentioned the protests that were held against the announcement of banning diesel autos. Though the State have banned the use of vehicles which are more than 15 years old, many old vehicles are still plying on the roads, he said. People are buying old vehicles which are banned outside Manipur and driving them here. Per day, 500/600 diesel vehicles can be driven in the city but above 2000 diesel vehicle are being driven on a daily basis beyond the permissible limit. He said that out of 100 registered vehicles 30 percent are unqualified for driving in the State. Knowingly or unknowingly, the people are violating many norms, rules and regulation of vehicle permissible limits, he said. While highlighting the different steps and measurement taken up by MPCB upon pollution control, he said that air pollutant testing is being done periodically per day. The State has reached the tipping point regarding the effects of climate change. In the last 10 -20 years back, pollution issue were less, there were no pollution. The State has been blessed with proper source of natural and environment condition fitted with fresh water lakes and hill. Due to progressive work for developmental and human needs, mankind has influenced the natural cycle. Many animals, birds and fishes have become extinct and climate changes are occurring, he added. He appealed people that maintaining pollution and creating a better environment should be kept as the first priority because developments will not be possible if the people are not healthy. He appealed to work hard on reduce maximum amount of pollution. Stressing on the issue of ignoring vehicles manual by drivers, he said that many company has started making vehicles with pollution free. He encouraged all to drive E-Vehicles more and avoid pollution causing vehicles. It may be mentioned that Radiant Group with tagline ‘Let us grow together’ is one of the vibrant growing and expanding group of companies in Manipur. The corporate office is located at Sega Road, Konjeng Leikai. Radiant E- Ride is one of the unit of the group initiating the campaign of Green Manipur with the agenda of reducing noise and air pollution in the state. They aim to changing the day to day transportation and commuting mode used into more environmental friendly electric vehicles which has zero emission and zero fuel consumption with low maintenance cost, with a vision of making Manipur pollution free. An electric vehicle is environmentally friendly and produces less harmful impacts to the environment than comparable internal combustion engine vehicles running on gasoline or diesel or one that uses certain alternative fuels. Radiant E-Ride has already started making two wheelers and three wheelers available in our State and has served more than 200+ customers who are now proudly own the E-Scooters and E-Rickshaw. The main reason for organising Green Manipur campaign is to understand the customers experience and to show deepest gratitude for being the part of change by changing to E-Vehicles. On the function, E-vehicles owners shared their experience of driving E-Vehicles. Nepram Romeo, managing director of Radiant Group attended the function.